Diversity Sails Forward: Introducing Captain Belinda Bennett, Windstar’s First Black, Female Ship’s Master. A fitting bit of news for March – introducing Captain Belinda Bennett. 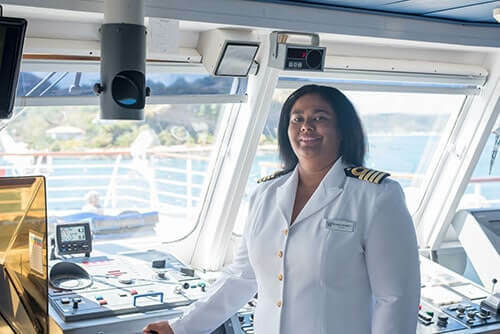 In addition to being the first female and black captain in Windstar’s history, she is the first black female captain in the commercial cruise industry. An exclusive handful of women are currently making waves as captains, with the first American female captain tapped just less than a year ago to helm a mega-cruise ship. And for a bit of perspective: the first female of any nationality/ethnicity appointed to command a major cruise ship occurred less than a decade ago in 2007! As captain Bennett is responsible for directing the operations and activities of officers and crew members onboard, including: safety, maintenance, certification, documentation, passenger services and compliance with multi-government regulations. As guests who have sailed with us know, our captains are highly accessible operating under our open bridge policy, and Bennett is known for being sociable and engaging with Windstar yacht guests. Bennett, 40, is a British citizen and resides in Southampton, United Kingdom when she is not aboard Windstar Cruises. Her maiden voyage as captain set sail on January 30, 2016, with 102 international crew aboard the 148-passenger Wind Star cruising in the Caribbean. Bennett is preparing to captain Wind Star’s trans-Atlantic sailing from the Caribbean to Europe. Her new job will keep Bennett busy at sea into May, at which time she intends to enjoy a brief break before returning for Wind Star’s summer season in the Aegean Sea, offering a series of 24 consecutive Greek Isles cruises. We were able to catch Bennett amidst one of her busy days at sea to get to know her a little better. Read on to find out more! What did you want to be when you were little? I wanted to be a marine biologist in my younger years. I guess I always had a passion for the sea! What qualities must someone possess to become a good cruise ship captain? You have to be a good communicator – able to both talk and listen. You also need to be visible to both guests and the crew. What are your three top priorities as master of Wind Star? That my guests and crew are safe, with the guests having an enjoyable, memorable time onboard our yacht. I also want to ensure the crew are happy and content – only then can they provide the best service to our guests. What are your three favorite ports-of-call and why? Just three? I so love the Dalmatian coast. The Croatian coastline and ports are beautiful! And for anyone who has sailed with me, they know I have a particular affinity for Sorrento in Italy, where I have a personal traditional of buying Italian leather handbags. You’ll notice the word “handbags” is plural. I also enjoy sailing to Bequia in the Caribbean, where my favorite spot is Mac’s Pizzeria for a slice of delicious lobster pizza. In Portoferraio in Elba, you can find me eating the best gelato on the planet. How does a guest get to have dinner with you at the Captain’s table? Sail on Windstar several times! Repeat guests are normally invited to dine at the Captain’s Table, and I love meeting Windstar guests at this special tradition. What is your best advice for first time cruisers? Disregard the notion that cruising is for the more mature community. There are some fabulous places that cruise ships like Wind Star call at whereby you get to see multiple cities and islands you would not normally see by staying in one place. The activities and adventures cruising offers rival those offered by land-based resorts.